If you’re dreaming of building a log home in Indiana, Illinois, or anywhere in the United States, you’ve come to the right place. At Country Creek Log Homes, our goal is to help make your dreams a reality. We look forward to working with you and your plans to find the Timberhaven Log and Timber Home package that will best fulfill your personal needs. We can also design a complete custom log home plan to showcase your individuality. We would like to help you achieve the best quality and value in your new log home. Although we are only minutes from Chicago, Illinois; South Bend, Indiana; and Benton Harbor, Michigan; in beautiful Chesterton, Indiana, we build kiln-dried log homes all over the United States. With Timberhaven Log and Timber Homes designs and our vast experience as log home builders, your possibilities are limitless. From the design to completion, we are there to help make it an affordable, pleasant process. It all begins with you and the right setting. 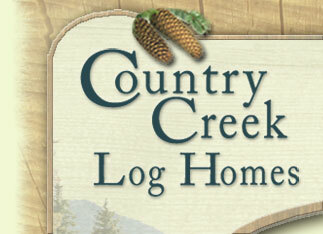 Country Creek Log Homes can assist you in finding just the perfect place for your new home. If a spacious country setting is your desire, we offer land for sale in our Country Creek Subdivision, a unique log home community worth considering. To help with those finishing touches, we can also design and sculpt beautiful landscapes. And finally; Country Creek Log Homes can outfit your home with a fine assortment of rustic furnishings and log home accessories.